If it ain’t brocade, don’t fix it. 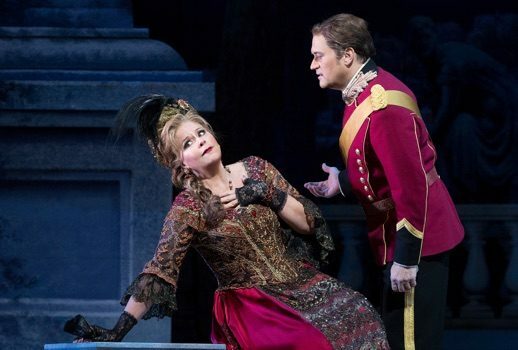 The most distinct pleasure of The Merry Widow at the Metropolitan Opera was the polished, yet warm, performance of Susan Graham as Hanna Glawari. Her cultivated, gathered mezzo caressed each phrase of Lehar’s sentimental score. She sounded as fresh and effortless as when she debuted at the house in the early 90s. While her spoken dialogue was not nearly as natural in its production, Graham still managed a folksy, relaxed approached to the role. However, though Graham’s singing was lovely, it was probably the lone reason to advocate for a revival of Susan Stroman’s production from early 2015. The operetta, a lighthearted concoction about a wealthy widow pursued by money-grubbing suitors, registered as a minor work. It felt more appropriate for a Broadway theater than the operatic stage. I’m not trying to be pejorative. Minor works and minor composers can often yield great pleasure and wisdom. For example: Barber, Copeland, and Gershwin. Lovely artists—genius, even—though minor in the operatic repertory. Graham often does well in this intimate sphere. One thinks of her early recordings of Reynaldo Hahn and Ned Rorem. She is sensitive, expressive, and musically astute, giving attention to the most minor (pun intended) details. On Thursday night, Graham’s artistry, as stellar as it was, could not sustain the evening. Despite the earnestness of the production, there was a forced, stiff quality throughout the proceedings. To begin with, the dialogue did not fare well in the larger house, especially when performed by opera singers. And the schism between the style of The Merry Widow and the physical space it was presented in chilled any warmth and exuberance generated by the piece. Even the vivacious Grisettes, dancing the can-can and doing splits, couldn’t shake off the evening’s robotic, lifeless quality. But it wouldn’t be fair to place all the blame on a mismatch between venue and style. Lehar’s score is charmingly evergreen; this was especially apparent when conducted by Ward Stare (gracefully making his debut). Some responsibility should be assigned to Stroman’s production, which felt stagnate and rudimentary, nostalgic to the extreme. It refused to do anything more than what was completely expected. This may be, in part, due to the belle-époque sets, which looked stale and cheap; they exacerbated the sense that things were thrown together (though, this frugal, haphazard quality was counteracted by William Ivey Long’s sumptuous costumes). And the direction’s tone and style were very old—out of touch—a tough mistake to make when one is working with such nostalgic material. For example, Carson Elrod, as Njegus, turned in one of the more bizarre performances I’ve seen on the Met’s stage. He pranced around like a closeted homosexual, and his stereotypical hijinks had an uncomfortable tinge of queer minstrelsy. It wasn’t funny; it was very 90s. Paul Groves, as Hanna’s romantic interest Danilo, seemed unprepared. The unfortunate consequence of displaying subtitles for spoken English dialogue was that the audience knew when the performers forgot a line or two. While Groves was not the only one to make this type of mistake, his flubs were the most grievous; he left out bits of information central to the plot. His singing was adequate, if tentative—his main preoccupation appeared to be getting through the night. In contrast, Sir Thomas Allen was charismatic as Baron Mirko Zeta. His command of the stage was undeniable, even in the role of a blundering aristocrat. As his faithless wife Valencienne, Andriana Chuchman delivered all the coquettish charm desired. She, more so than the rest of the cast, handled the demands of the spoken dialogue with wit and ease. And her warm, even soprano offered additional reasons for admiration. As her lover, Camille, David Portillo was suave, romantic, and sweetly guileless in all the right ways. His tenor floated through the score, reassuringly secure through the higher tessitura. Which is to say, the performances were generally competent. But one wondered to what end. A large question mark hung in the air—what was the point? The evening bored me. It felt tired. Beyond the vibrancy of Graham’s voice, everything else rolled forward, perfunctory and tedious. There was a lack of urgency, a lack of vitality. Whether this was due to the production, the material’s unsuitability for the house, or a combination of both—it was hard to tell. In the end, did it even matter? The results were, nevertheless, the same.